Bring the water to a boil, then turn of the heat and add the lemons, sugar and honey. 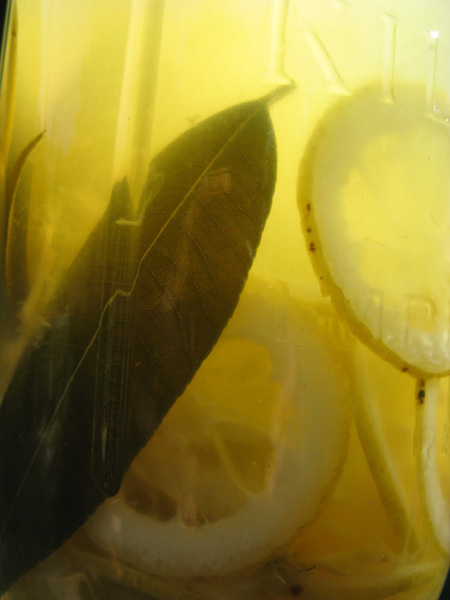 Stir to dissolve the sweet things, then add the lemon myrtle leaves and ginger. Cover and let the liquid come down to room temperature. Transfer to a glass or ceramic vessel, add the yeast, and cover with muslin or cloth. Leave to ferment in a warm, dark place for 24 hours. Strain the liquid, then transfer to the vessel(s) in which the end product will be refrigerated. Share the raisins equally if more than one vessel is used, then seal the vessel(s). Let the brew rest in the dark for 4 days, then refrigerate.